Dollar spot is caused by fungi in the genera Moellerodiscus and Lanzia. Formerly, it was attributed to Sclerotinia homeocarpa. 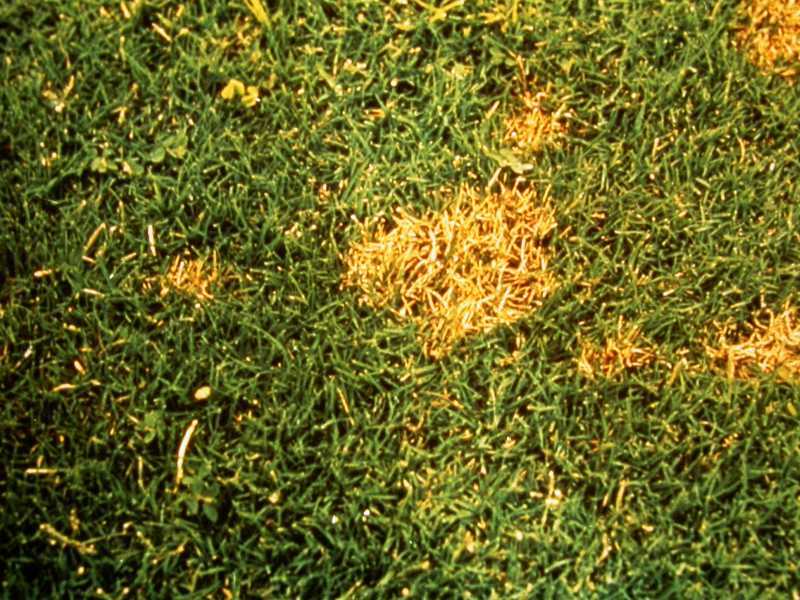 The disease is a common problem on golf courses, but it may also be prevalent in bluegrass and fine fescue lawns. It occurs from late spring to late fall and is most prominent after cool moist weather. The disease is typified by small circular areas of straw-colored grass, which range from one to six inches across. These circular areas may grow together to form large, irregularly shaped areas. Examination of individual leaves will show strawcolored lesions with reddish-brown borders. The leaf tip may remain green while the lesion extends across the blade. A white, spider web-like growth covering the infected area may be visible in the morning, especially if dew is present. When examining samples for symptoms, don’t just look at the infected areas. Check the fringe areas where there is some healthy material and part of the sample is on the decline, thus inspecting a sample in all phases of the disease. 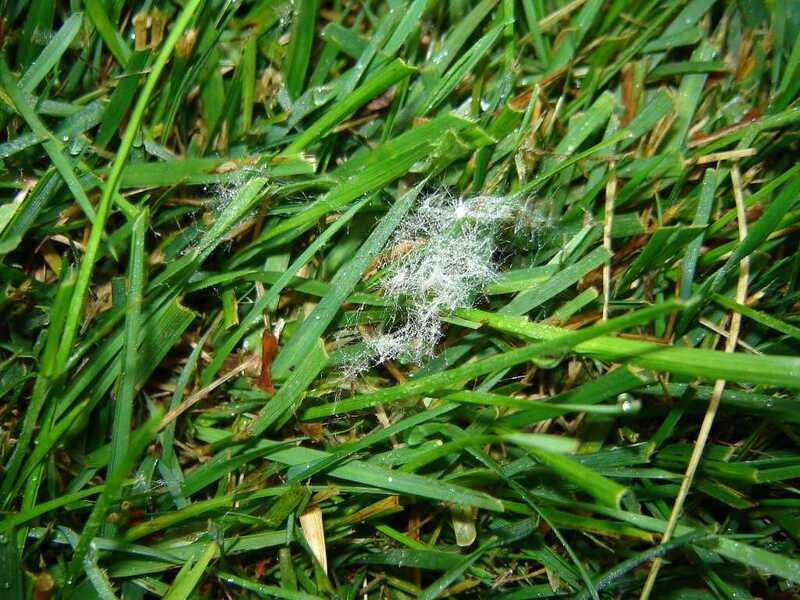 The dollar spot fungus survives unfavorable temperature and moisture conditions in plant tissue and thatch as dormant, compact masses of mycelium called sclerotia. It can grow over a wide range of temperatures (50 to 90 degrees F), but disease development is greatest at temperatures between 70 and 80 degrees. The fungus needs moisture from dew, light rain, or irrigation to infect leaves, but once established, it can progress even during times of low moisture. 1. Fertilizer. Low nitrogen and potassium levels in the soil can increase the severity of dollar spot, but excessive nitrogen increases the susceptibility of grass to dollar spot and other diseases. Avoid applying high levels of fertilizer in the fall. Use a soil test to establish a balanced fertilizer program. 2. Remove excess thatch. Thatch greater than 1/2 inch thick can lead to moisture stress and predisposition to dollar spot. 3. Mow. Mow frequently at recommended heights. 4. Watering. Water to a depth of about 6 inches. Frequent watering provides an ideal environment for disease development once it is started. Water early in the day so that foliage dries quickly. Do not water late in the day when the grass will remain wet for several hours. 5. Promote drainage, shade reduction, and increased air movement. Provide good surface and subsurface water drainage to reduce humidity in the turf. Reducing shade and increasing air movement over turf can also help speed drying. 6. Cultivars. Select resistant cultivars. 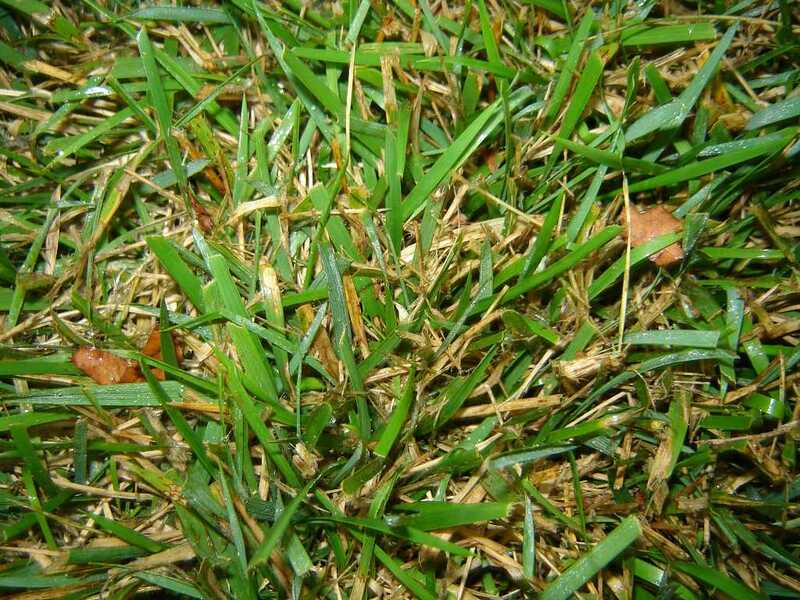 Before seeding, consider recommended cultivars that are resistant to dollar spot. Consult with experts to obtain a list of less susceptible cultivars. Then use a mixture of at least two or three of these to diversify the lawn and reduce disease spread. 7. Fungicide. Once the disease has been identified, use a preventive fungicide program with recommended fungicides. Read labels for proper fungicides and their use. Pesticides registered for use include: chlorothalonil (Daconil), cinnamaldehyde (Cinnamite), iprodione (Chipco), mancozeb, maneb, thiophanate methyl (Cleary 3336), thiram, triadimefon, and vinclozolin. Strategies 2, 3, 4, 5, and 6 are strictly organic approaches. Using an appropriate organic fertilizer would be a viable organic approach to Strategy 1.